Pu-erh is an acquired taste, at least, so I thought until I learned that there is sheng (raw) and shou (cooked) puerhs. My first experience with puerh was with a not every well made sho puerh. I think it was a shou; it tasted like a barnyard. My second experience with puerh was with the guidance of Thesera of T Shop. I drank a white and puerh blend as well as a Banuo raw puerh. Both were very good. One day I saw on Wymm Tea's Instagram a photo of the company's Mangnuo Tengtiao "Cane" Sheng Pu-Erh. When I read "cane" I thought of sugarcane (my Caribbean roots showing up). I asked the company for more information about the origin of the Mangnuo Tengtiao "Cane" tea which they provided as well as samples of four raw puerhs. The Mangnuo Tengtiao "Cane" Sheng Pu-Erh from Ancient Tea Tree 2014 First Spring is one. Another is Bingdao Laozhai Huangpian Sheng Ancient Tea Tree Pu-erh 2014. 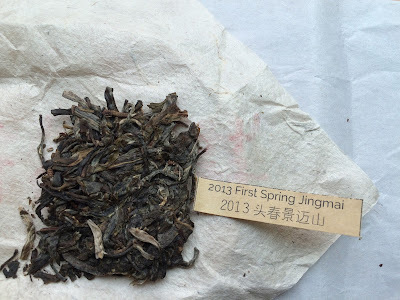 The third and fourth are the 2013 1st Spring Jingmai and 2010 Spring Kunlu Mountain which are the subject of this review. The aroma of the Kunlu after a 25 second steep was woodsy and caramel-like. It had an earthy (baby portobello mushrooms cooked in a cast iron skillet) taste and a long finish. At the 30 second steep, a bark-like flavor emerged. The liquor was dry and smelled of dried fruit. The third infusion for 35 seconds yielded umami notes and stained my cheeks. The Jingmai grabbed my attention almost immediately. After a rinse, the wet leaves released an aroma of apricots. There was also the sweetness of dried fruit like cherries and plums. This very pleasing aroma disappeared with the first infusion but the liquor had a lingering sweetness. I steeped the leaves for a second time for 30 seconds then a third time for 35 seconds. At the latter, there was a crescendo of flavors including a floral note (it's supposed to be orchid). The liquor was dry and had a long finish. At the 40 second mark, the liquor was still dry but a nutty note emerged, similar to marzipan. The fifth infusion at 50 seconds was fruit heavy. The array of flavors tapered off at 50 seconds and were mostly gone by 60 seconds. I think this was due primarily to the fact that I was experiencing tea drunkenness. The Jingmai was my favorite of the two raw puerhs reviewed here. I look forward to preparing the other two puerhs. Puerhs courtesy of Wymm Tea.